Spray paint the clip at the top a fun color (you don't have to do this step if you don't want...). You might want to spray a clear protective coat on top. 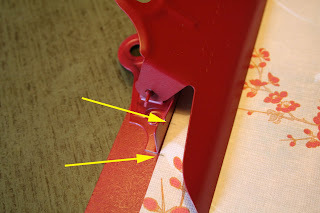 After the paint is dry, take your paper and make 2 marks on either side of where you'll need to cut the paper so it can fit around the clip mechanism. This is what your paper will look like after you cut it out. 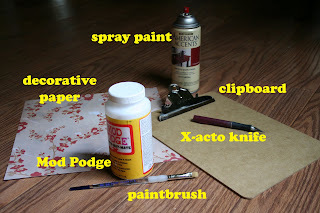 Apply a good amount of Mod Podge to the clipboard. Start with the top (under the clip) and then lay down the paper. Then continue to coat the rest of the clipboard making sure to give the edges a nice layer of glue. This is what the back of your clipboard will look like once you've attached the paper. Once the glue has dried, use your X-acto knife to cut around the clip. You may need to add more glue to keep the paper attached. 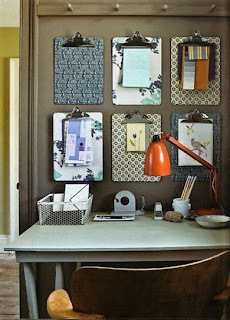 Flipping your clipboard over, simply use your X-acto knife to cut off the excess paper using the clipboard as a guide. Make sure to use a nice sharp blade on your knife to keep from ripping the paper. Here's mine. My space is obviously smaller so I only did 2 clipboards, but I'm happy with the way they turned out and I love how they'll help me organize!